Reviews on TripAdvisor can make or break a hotel, a fact many hoteliers have come to accept. While review quality is important, the number of reviews your establishment has on TripAdvisor plays a significant role in its popularity and in the number of eyes that see it. Before we discuss the most effective way to increase your reviews on TripAdvisor, let’s first take a look at why TripAdvisor is so important. According to Steve Kaufer, the President and CEO of TripAdvisor, the site had more than two billion unique visitors in 2013. During the same year, a study from Google Think and Ipsos MediaCT found that 61% of travelers consider TripAdvisor to be an integral part of their decision-making process, falling just behind recommendations from family and friends. In 2014, TripAdvisor’s fourth-quarter financial report stated the site received more than 140 million unique mobile visits per month. According to Kaufer, mobile traffic only represents 48% of all the site’s traffic. Furthermore, according to TripAdvisor, the site received up to 375 million unique visitors per month on average as of the second quarter of 2015. That’s a lot of eyeballs for your hotel, and on a site that is so highly trusted by visitors. – Quality of Reviews: the more positive reviews you have, the higher your ranking will be. – Quantity of Reviews: a higher number of reviews will also give your popularity ranking a boost. – Age of Reviews: reviews that are recent have greater weight in the ranking algorithm than older ones. Quality is essential, but quantity and freshness of reviews also matter. For example, if you have 50 reviews overall, and 40 of them are very positive but from three years ago, while the more recent 10 are very negative, the latter will matter more in your score than the former. And if all other factors are equal (quality and age of reviews), the hotel with the higher number of reviews will be ranked higher. TripAdvisor recommends asking guests to write reviews on TripAdvisor, but you can only ask so many times before you start sounding desperate. And you can’t pester a guest throughout their stay, or you’ll end up alienating them. They might review your hotel, but it might not be the review you were hoping for. There is a solution, though. TripAdvisor offers a free system called Review Express, which will boost your reviews significantly. Review Express helps you collect reviews by sending out professional emails which are designed to encourage guests to write a review of your hotel. Emails can be customized with your branding and a dashboard offering in-depth analysis and tracking is also available. TripAdvisor claims Review Express has helped hoteliers increase the number of reviews they get by, on average, 28%. This is a significant number and it can have an important impact on bookings. You can also use Review Express to conduct private surveys and obtain actionable feedback from your guests, providing you with further information that you can use to improve the customer experience. So, why does Review Express work so well? 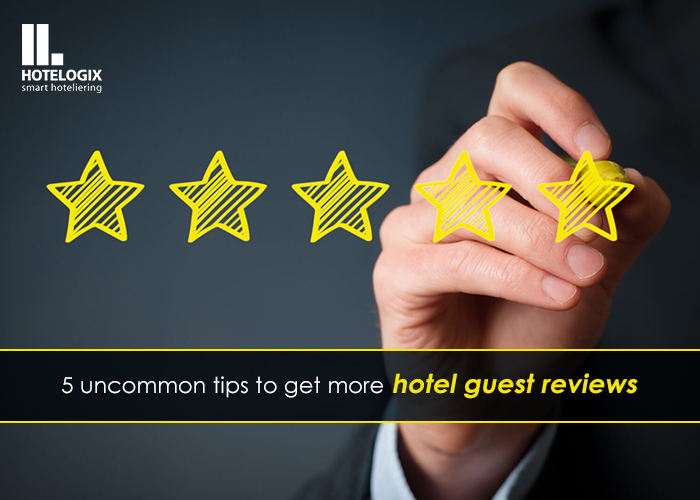 Simply put, it reminds guests to leave reviews, but it does so without being intrusive. Furthermore, it makes it easy for guests to write a review, with a rating link right in the body of the email. The less effort a guest has to expend, the more likely they will be to leave feedback. But Review Express doesn’t stop there. You can take it to a whole new level. If you hook it up with your hotel management system, like Hotelogix, the entire process becomes automated. As guests check out, they will automatically receive the email requesting a TripAdvisor review. A TripAdvisor review is like gold in that the more you have, the happier you will be. TripAdvisor is one of the most influential websites for travelers looking to find accommodation options, which is why your goal should be to get to the top of the TripAdvisor page for your geographical location. Review Express, courtesy of TripAdvisor, is a highly effective system that will help you increase the number of TripAdvisor reviews your hotel receives in a simple yet elegant fashion. Best of all, this review collection can be automated if you hook it up to a hotel management system, like Hotelogix, so all you have to do is ensure an amazing guest experience and then watch the reviews start rolling in. "The #1 Way to Get More Reviews on TripAdvisor", 5 out of 5 based on 1 ratings.